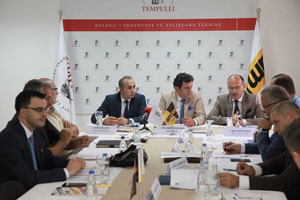 A roundtable discussion was organized by College “Tempulli” on "Analysis of the safety situation in Kosovo roads", aimed at checking the role of institutions in increasing traffic safety and undertaking concrete measures in order to improve the situation of safe circulation on the roads of the country. Minister of Internal Affairs, Bejtush Gashi stated that “Referring to the current situation on traffic accidents and their consequences the Kosovo Police has undertaken serious additional measures with the aim of improving the road safety level, preventing traffic accidents and enforcing law in function of road traffic management and control. To this end, the Kosovo Police, as of 24 July 2018, has established the "TASK FORCE" for prevention of accidents in road traffic”. Being aware of the numerous accidents, all the roundtable participants assessed that they should come up with concrete steps in order to reduce the number of traffic accidents.